There’s always something inspiring and exciting going on here. Every day Pennswood Village is abuzz with activity. From art gallery shows and yoga classes, to lifelong learning opportunities and cultural performances, residents can always find an abundance of things to see and do. This page posts the latest news about events and happenings, from announcements about your favorite causes to new staff members. Just click on the title of the press release to get all the details. Be sure to check back often, as items are updated regularly. Also, if you have news to share, please call 215-504-1118 or email us at info@pennswood.org. On Sunday, March 24, an exhibit of Linda Celestian’s paintings and sculptures will open at the Pennswood Art Gallery, 1382 Newtown-Langhorne Road, Newtown, PA with a wine and cheese reception from 3:00 to 4:30 p.m., preceded by an illustrated presentation by the artist from 2:00 to 3:00 in Penn Hall. Both events are free and open to the public. Growing up in upstate New York and spending summers on her family’s boat on the Great Lakes helped develop Celestian’s keen kinship with nature and use of natural markings in her work. 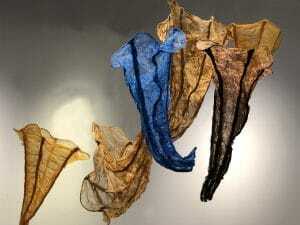 Celestian, who has exhibited widely, received a BFA from Moore College of Art, completed a year of graduate studies in fine art and has received numerous grants from the Delaware Division of the Arts. The Pennswood Art Gallery, which has been exhibiting artists for 34 years – including such famous names as Harry Leith Ross, Daniel Garber, and more recently Jon Redmond, Earl B. Lewis, Bruce Garrity, William B. Hogan and Peter B. Treiber – is a non-profit, contemporary fine art gallery located in Pennswood Village on Route 413 south of the Newtown by-pass, adjacent to George School. For information about the exhibit and pre-opening artist’s presentation call 215-968-9110. January 23, 2019. 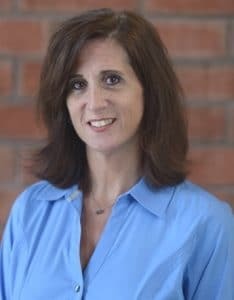 Newtown, PA – Pennswood Village, a Bucks County continuing care retirement community, welcomes its new Director of Development, Susan Vanscovich. Pennswood is honored to have Susan, a Certified Fundraising Executive (CFRE) with an impressive 27 years of experience in development join the senior management team to lead its stewardship and fundraising efforts. As the Development Director, Susan will coordinate, support, plan and implement fundraising activities and programs for Pennswood Village’s philanthropic initiatives. Residents, staff, families and friends have contributed generously over the years to Pennswood’s Fellowship Fund, a fund that assists residents with financial support when their assets become depleted through no fault of their own, the Employee Scholarship Fund, capital campaigns, and many other efforts. Susan’s role will be to engage and steward the residents and local community to support the vision and strategic goals of Pennswood Village. Susan comes to Pennswood from the WCU Foundation and West Chester University where she enjoyed a long and successful career spanning a combined 21 years. During Susan’s tenure, WCU celebrated three successful capital campaigns and posted its most successful fundraising results while she served in a variety of capacities including Chief Advancement Officer, Chief Operating Officer and for one year, the Interim CEO. Susan is currently working toward a Doctorate in Public Administration/Nonprofit Management from West Chester University; holds a M. Ed. from Temple University, and a B.A. in Communications from Penn State University. She is a Member of the Association of Fundraising Professionals (AFP) and has served on the boards of several cultural and service organizations in Chester County where she lives, including the Brandywine Ballet Company, March of Dimes (SE PA) Women of Achievement Committee Member. Susan resides in West Chester, PA, with her husband Paul and their three children Lucas, Zachary and Victoria. On Sunday, January 27, 2019, an exhibit of Matthew Colaizzo’s wood block prints will open at the Pennswood Art Gallery, 1382 Newtown-Langhorne Road, Newtown, PA with a wine and cheese reception from 3:00 to 4:30 p.m., preceded by an illustrated presentation by the artist from 2:00 to 3:00 p.m. in Penn Hall. Both events are free and open to the public. 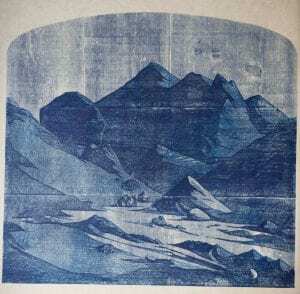 Colaizzo works in the ancient medium of wood block printing interpreting present day bits and pieces of our everyday urban and wild landscapes in a spare and stark manner reminiscent of the great Japanese print maker, Hokusai. By so doing he lets us see the universality of a rubble heap, a building site of an on-ramp to I95, or a steep walled quarry, or a vast modern building excavation, or perhaps a scene that could be a picture from a current Mars roving space craft. By incorporating elements such as the edges and knots in the pine wood planks he uses (purchased from his local Home Depot) he encourages our imagination to expand one of his landscape’s sky to incorporate cosmic elements – the old with the new – or in other instances micro to macro or vice versa. As Colaizzo says his “images… investigate our human mark on the planet.” He states further that he blurs the line between the natural and unnatural, and that he hopes to encourage the viewer to examine our place on earth. Colaizzo, a member of the Tyler School of Arts faculty and a graduate of the Pennsylvania Academy of Fine Art, has an extensive exhibiting background reaching from Rome, Italy, to New York, New York. His work has been reviewed in such prestigious publications as The Washington Post, Philadelphia Inquirer and Title Magazine. The Pennswood Art Gallery, which has been exhibiting artists for 34 years including such famous names as Harry Leith Ross, Daniel Garber, and more recently Jon Redmond, Earl B. Lewis, Bruce Garrity, William B. Hogan and Peter B. Treiber is a non-profit, contemporary fine art gallery located in Pennswood Village on Rt. 413 south of the Newtown by-pass, adjacent to George School. For information call 215-968-9110. Pennswood Village will host a Candidate Forum for the 142nd PA State Assembly District on Thursday, November 1 from 10 to 11:30 a.m. in the Community’s Penn Hall. Former Langhorne mayor emeritus Chris Blaydon will moderate and ask each candidate the same questions, solicited from Pennswood Village residents in advance — and written questions from the audience. Lauren Lareau (D) will go first (previously decided by a coin toss) followed by Frank Farry (R). Candidate profiles and positions are available at Vote411.org. Pennswood Village Foundation Board. Front Row: Susan Abtouche, Nancy Morrill, Cindy Johnson. Back Row: Michael Griffin, Ron Slivka, David Satterthwaite, Dan Murray, Bruce Woodger, George McLaughlin. 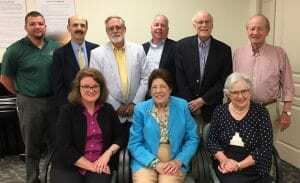 June 7, 2018: Newtown, PA – The Pennswood Village Foundation met for its first annual meeting on May 30, 2018. The Pennswood Village Board of Directors, with the support of the Pennswood Village Residents Association and Hospice Care by Pennswood Village, established the Pennswood Village Foundation in November, 2017, to serve as the philanthropic arm of the senior living community, located in Newtown, Bucks County. Executive Director of the Pennswood Village Foundation, Susan Abtouche. Pennswood Village is a Quaker-directed continuing care retirement community (CCRC) for people 65 and older. Nestled in the beautiful countryside of Bucks County, Pa., Pennswood is a welcoming place of true hospitality that offers many opportunities for physical, intellectual, social and spiritual growth. Find out more at pennswood.org. Newtown, PA – Pennswood Village resident Jim Smith has been appointed to serve on the Middletown Township’s Disabled Persons Advisory Board. As a polio survivor, Jim has been a volunteer and advocate for people with disabilities throughout his life. In addition to his work with the board, Jim has worked with the University of Villanova’s College of Nursing in a ground-breaking program called “Standardized Patients with Disabilities,” which aims to teach nurses and nurse practitioners the skills needed to help patients who are disabled or wheelchair-bound. In the past, the board has worked to increase the number of accessible parking spaces within the township and also to increase access to ball fields and parks. The board also worked with the Public Works Department on the importance of snow removal at crosswalks, and assisted in the acquisition of a listening system for the hearing impaired for the public hall in the municipal center. The Middletown Township Board of Supervisors established the board in 2000. Board members serve 2-year terms, and the board holds monthly meetings that are open to the public. Jim and his wife Mary came to Pennswood from Penndel, PA, in November 2015, after being active in the community’s polio support group, as well as the choral group. For volunteer opportunities with the Disabled Persons Advisory Board, you can visit them online. November 15, 2017. 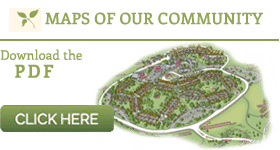 Newtown, PA – The Pennswood Village Board of Directors has established the Pennswood Village Foundation to serve as the philanthropic arm of the senior living community, located in Newtown, Bucks County. Today, the Chair of the Pennswood Village Board of Directors David Satterthwaite; the President of the Pennswood Village Residents Association Leslie Wendel; and the Chair of Hospice Care by Pennswood Lance Mervine, gathered together with members of the organization’s Stewardship Committee to sign the Articles of Incorporation. The Stewardship Committee Members are: Nancy Morrill, Clerk; Susan Abtouche; Bob Anderson; Delia Dandridge; Jennifer Doone; Helen Greven; Michael Griffin; Ben Hoyle; Cindy Johnson; Paul Keenan; Linda Krause; Harriet Maneval; David Satterthwaite; Leslie Wendel; and Bruce Woodger.